Middleton, WI – Extreme Engineering Solutions, Inc. (X-ES) is shipping the XPand4201, a sub-½ ATR, forced air-cooled enclosure for conduction-cooled modules. The XPand4201 is designed to reduce the Size, Weight, and Power (SWaP) of deployed military systems. 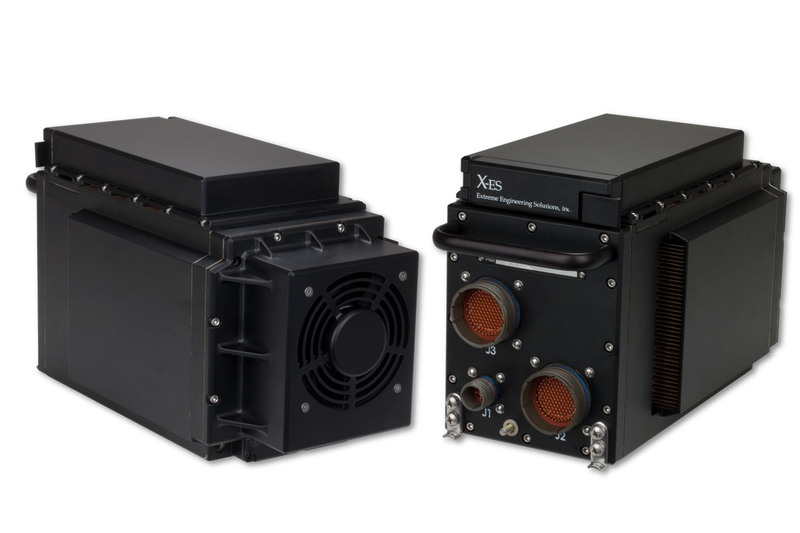 A fully populated XPand4201 weighs less than 19 pounds and is ideal for C4ISR applications in vehicles such as UAVs, helicopters, planes, tanks and light armored vehicles, HMMWVs, and UGVs. The XPand4201 conducts heat from conduction-cooled modules to heat exchangers, where the heat is dissipated to the ambient environment by forced-air cooling. Its sidewall heat exchangers are 1/2" wider than those of the XPand4200 to provide increased cooling, while a heat exchanger integrated on the top of the XPand4201 allows for significantly higher cooling capability over similar systems. Because the design supports conduction-cooled boards in an air tight enclosure, the XPand4201 provides enhanced shock and vibration protection and isolation of the boards from the outside environment. Up to five conduction-cooled, 0.8” pitch 3U VPX payload modules and one 3U VPX power supply module can be configured into the 5.88” (W) x 6.0” (H) x 13.5” (D) XPand4201. The system has an optional removable memory module attachment that supports the XPort6192 Solid State Disk (SSD) Removable Storage Module, with 256 GB of encrypted storage capacity. With the memory module attachment the height increases to 7.62”. The XPand4201 can be configured to meet custom I/O requirements with conduction-cooled PMC / XMC modules available from X-ES or third parties. It also supports 10-Gigabit Ethernet, Gigabit Ethernet, graphics, RS-232/RS-422, MIL-STD-1553, ARINC 429, CANbus, CameraLink, GPIO, and digital and analog I/O. An optional front panel USB port provides system monitoring and maintenance capabilities. There are several power supply options, supporting a MIL-STD-704 28V DC or 115V AC input, as well as internal EMI filtering and hold-up for up to 50ms.